The demand for aluminium doors looks set to eclipse that of uPVC sliding doors in the coming years. However, there is still a huge amount of homeowners looking for energy-efficient, secure and great looking uPVC sliding doors. This case is once of those. The couple who own the house are carrying out a full refurbishment of the property, including new flooring throughout, new plastering, a new kitchen and of course, a new set of windows and doors. It was to start with a new set of uPVC sliding doors. The old sliding doors in the aperture were non thermally-broken aluminium ones. This meant that they suffered with condensation on both the internal frame and glass too. This can cause serious problems when excess water runs down the frame and onto plaster or carpet. The cause for this is due to aluminium frames not being “thermally broken”, which means the frame is solely aluminium from front to back. Being metallic, the cold can transfer very easily through aluminium creating a cold internal surface for warm vapour to condense upon. This page explains the phenomenon in more detail. Other causes of condensation on the glazing can be caused be metallic spacer bars, which conduct the cold in the same way non thermally-broken aluminium does. This creates a cold spot all the way around the edge of the unit. This is quite nicely summed up in this document from the GGF (Glass and Glazing Federation), who are a recognised governing body within the industry. Getting back to the project, we attended the property to measure up the opening and were able to provide a quote on the spot. Having had other quotes already, they were impressed with it and gave the go ahead. We surveyed the doors for final measurements and everything got ordered up. Around 3 weeks later, the doors were made and we installed them in a morning. We even got rid of the old aluminium doors and recycled them. Have a look at the before and after photos below. 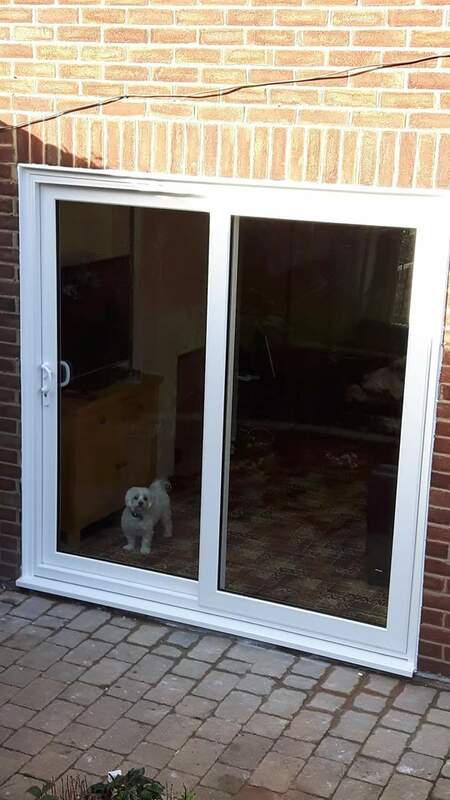 Even the pet dog is pleased with the new uPVC sliding doors!